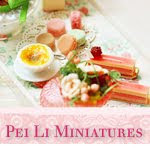 Wow wee ~ I know this takes way too long, but I have done all I could to complete this large order as soon as I could. Finally I can say that I'm done! This will go out in the mail this week to Toronto! 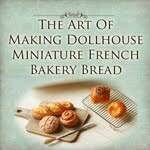 I had a very busy week at work last week, and was too tired to do much miniatures. However, I was determined to make some Christmas Cakes, as I wanted to make some mini scenes. I love the new stuff I gotten this week. Some materials, and 2 books. I haven't had much time to look through them as I just got them in the mail today. But maybe I should do a post on them next week! I'm so delighted today, that I have the honor of receiving the Arte y Pico award from Marie of Savon Marie. A big thanks to Marie, I feel so privileged to join the rest of the talented women. 1. You have to pick 5 blogs that you consider deserving of this award for their creativity,design, interesting material, and also contribute to the blogging community, no matter what language. 4. The award winner and one who has given the prize have to show the link of "Arte y Pico blog so everyone will know the origin of this award. I am proud to present you this award! You ladies have inspired me a lot! It's Monday again! I had a very good weekend. On Saturday after housework and creating some miniatures, I saw there was really good sunlight! 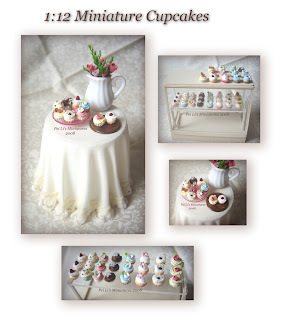 What a great opportunity to take some photos of my next batch of 1:12 miniature cupcakes. This batch will be sent to Carrie early this week. On Sunday, after another round of housework, I had time to experiment on new flowers. The book I bought yesterday was on making Clay flowers. They were not meant for miniature scale, but I just needed the technique, then I'll have to modify and see what I can do for 1:12 dollhouse miniature scale. 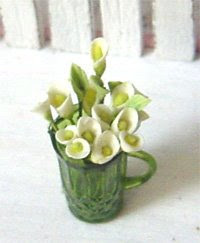 For a start, I made some Classic White Calla Lilies. 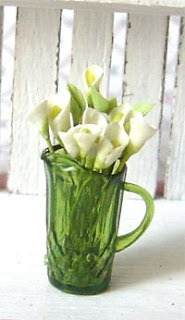 I intend to experiment making some other flowers whenever I can. 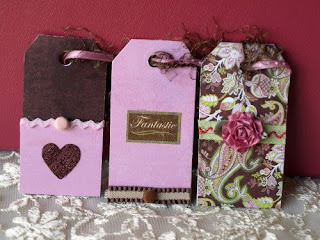 See Carrie's and mine latest "Pink Chocolate" gift tags. They are created with the finest detail in mind. 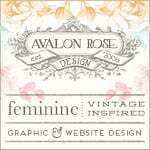 You are sure not to be disappointed with this one of a kind design. 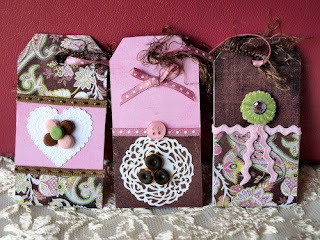 Images are courtesy of Noelle Garrett Designs. It's time for Show and Tell Monday again! 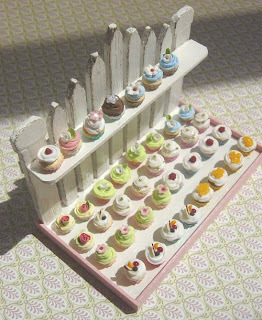 Last week, I re-visited the 1:12 Miniature Cupcakes again. A few weeks back, when I had some time, I sat down to start the journey of making them. The biggest challenge for me was making the piping, because each cupcake measures just 0.4 mm wide. After much experimentation, and of course failure along the way, I finally approve this batch of cupcakes. I love the colours and the feel of it. What do you think? If you see on the table, I had a US one cent coin as a gauge for scale. I can put 4 cupcakes on the one cent coin. Going to make a few more other coloured ones! Mondays are now special and exciting to look forward to, because of Show and Tell Monday. I enjoy browsing everyone's blog to see what are the latest happenings in your life. The poll was closed last week, and thank you all who have participated. Wow, it was interesting and exciting to see which colour was leading. I did experimented on Lemond Custard, but for some reason, the colour was still a bit way too bright! In the end, I painted a few coats of white over it. Right now, the chair seems a bit plain, but I thought of a beautiful idea to decorate that chair which I will work on this week. I can't wait to see it completed. 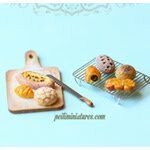 I worked on 2 new pastries (which I had to make for the bulk order) this weekend, and I placed the samples on the tray. I'm not sure if I'll use them in this piece, but I intend to add more work to it anyway.